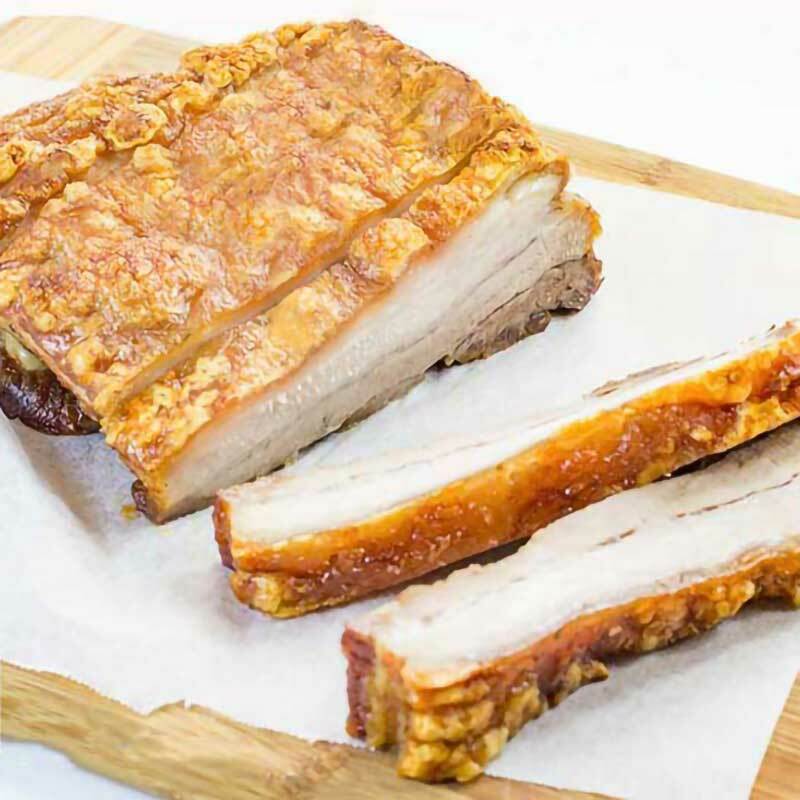 Roast Pork Belly with crackling is one delicious meal and with its high-fat content it suits the Keto Diet perfectly. Cooking pork belly is much easier than you think! If you find that the pork skin isn’t becoming as crispy as you would like, place it under the grill or broiler and keep an eye on it as it can burn quickly. We often buy pork belly in bulk and roast in a big batch, slice and freeze for a quick meal later on. To reheat, add 2 tablespoons of butter to your frying pan. Then fry the slices on medium to high heat for 4 minutes on each side until it’s crispy and heated through. This keto pork belly recipe serves 8 people. Serve the pork belly with a side of Lemon & Feta Broccoli Mash, or our Cauliflower Colcannon. Pork belly is the ideal keto meal. It’s very high in fat, protein and literally no carbs. 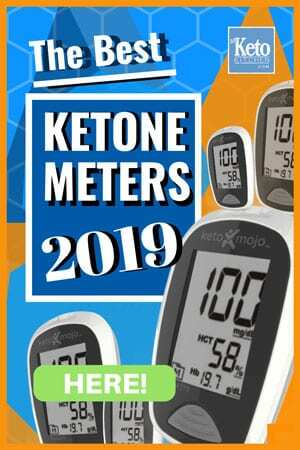 It’s great for all low carb diets (except vegan) and perfect for paleo too! Score the skin of your pork belly and pat it dry with paper towel. Rub the whole pork belly with the salt, pepper and olive oil. Place skin side up into a roasting tray with the rack removed, and into the oven for 25-30 minutes until the skin is starting to blister. Reduce the oven temperature to 160C/320F and continue to roast for 1 – 1 ¼ hours. Remove from the oven, wrap the tray in aluminum foil and leave to rest for 20 minutes before serving. 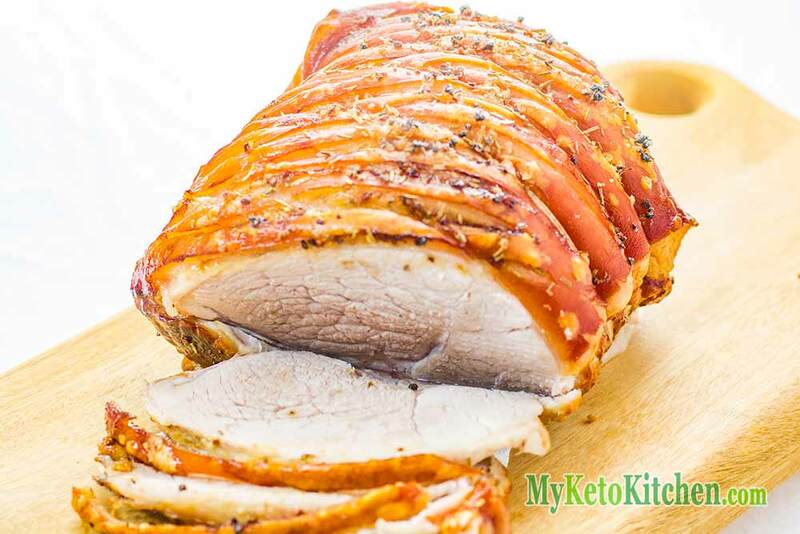 Roast Pork Belly is one delicious keto meal, with its high fat contents it suits low-carb diets perfectly. Learn the "Secrets" to the perfect "Crackling" It's much easier than you think! Place into a roasting tray, skin side up, and into the oven for 25-30 minutes until the skin is starting to blister. Remove from the oven, wrap the tray in aluminium foil and leave to rest for 20 minutes before serving. 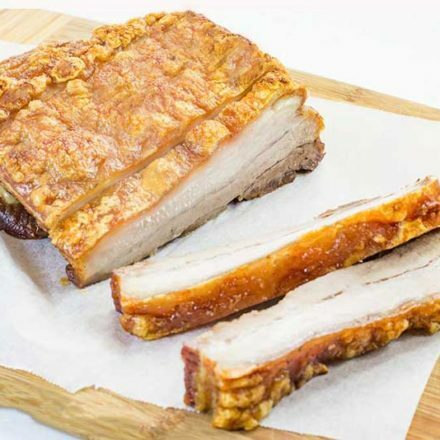 Is Pork Belly Good For Keto Diet? Pork belly is excellent for the keto diet it’s full of healthy fats, protein and has no carbs. Choosing pasture raised pork is the best option if you can find it and afford it, check the labeling. Also, pork belly is even better for a keto diet if you prepare your crackling correctly with added salt to keep up electrolytes. We love pork belly, its quite an affordable cut of meat and very filling. 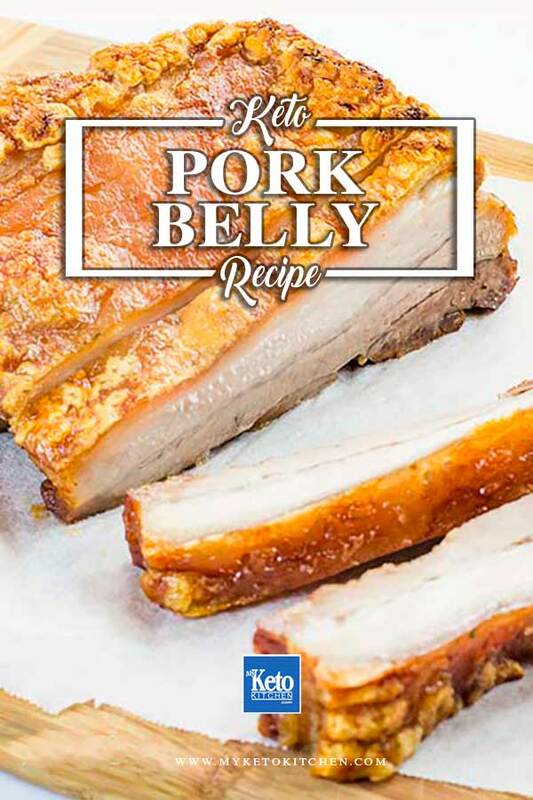 A juicy and crispy pork belly recipe thats keto friendly and perfect for low-carb high-fat diets. How Do You Crisp Pork Belly? 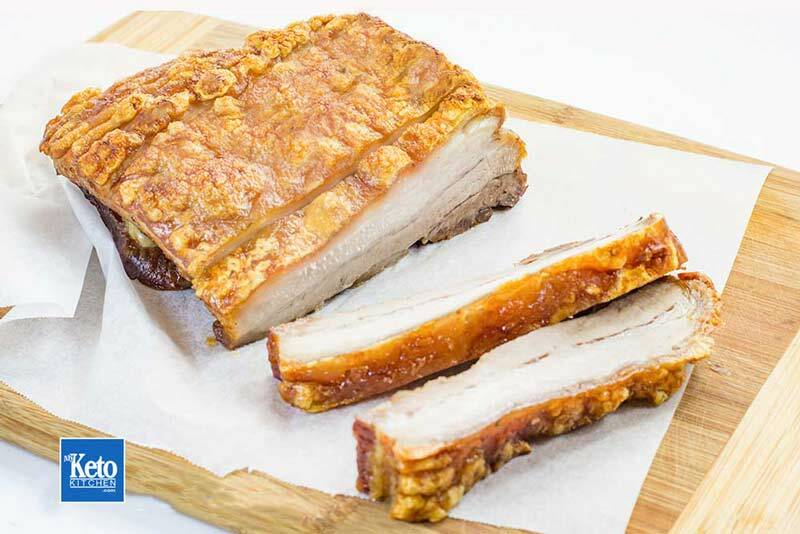 The secret to really crispy pork belly or crackling is to make sure that the skin is dry first then adding oil and salt to crackle. Pat down the skin or allow it to sit exposed to air for an hour or two. Score the skin about an inch apart. Coat with salt and a dash of pepper to taste. Massage and work the salt into the skin and into the scores. If it isn’t to your liking at the end of roasting, you can put under a low grill but keeping a good watch on it as you do. Check out the recipe above How To Roast a Leg of Pork. This was really nice and easy. I used sliced pork belly portions and roasted it for 30 mins. It was amazing! Thank you for sharing this recipe. Glad you enjoyed it, Aicee!